Glides over obstacles like rocks & logs without hanging up or damaging your shock linkage. Blocks mud from packing in around the linkage bearings. Is injection-molded from an ultra-slick & flexible composite material, giving you the crucial blend of performance and protection. Perfect fit. Easy to install. 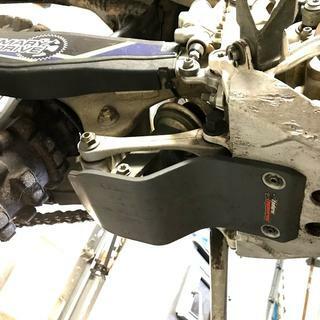 Installed onto my Enduro Engineering skid plate and covers linkage nicely. This is for gliding over obstacles without getting the linkage hung up. I don't think it's for absorbing impact, as this is just thick flexible plastic. I have it mounted to Enduro Engineering aluminum skid plate. I thought it would be closer to solidity of aluminum, but I guess it works fine like this since EE sells it to be compatible. It is good protection in my opinion and gives me the confidence to go over high rocks and logs. I aligned and drilled smaller holes while plate installed on the bike to be sure there is enough clearance for protruding bolts, and turned out to be enough room to get a ratchet from top to just put in screws with lock nuts, so I didn't use the threaded inserts. Great add on for stump jumping! 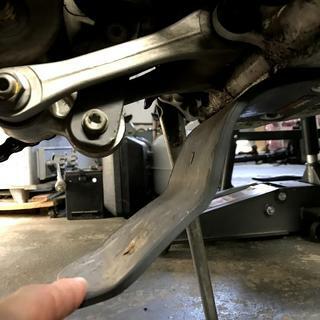 Easy installation on existing skid plate! A little HAry Homeowner skills needed. This was exactly what I wanted for my stock husky skid plate. I drilled a few holes and used some spaces of my own and bolts and its perfect. It does come with bolts but its intended to be universal so it will never be perfect fit you have to work a little on your own. But in the end it worked out 100%. Tough Too! Purchased this thinking it would bolt right onto the stock Skid on TE 300. Not the case. Holes don't line up exactly with a flat surface. A couple angles are caught making it tough so secure the threads into the plastic. Made some mods and got it to work but defiantly not a simple bolt on product. Would still recommend. Plastic is tough and has done its job so far. I have an Enduro Engineering Skid plate and linkage guard. Installing the linkage took a little bit of persuasion to put the crush nuts into the skid plate. What I ended up using is a Impact gun - which made it much easier- doing it by hand was a bit problematic keeping everything straight. So Far So good after about 500 miles or Rocks and Roots ! I bought it more as a mud flap to protect the linkage bearings, but I've dragged it over some proper rocks, and it's done it's job admirably! 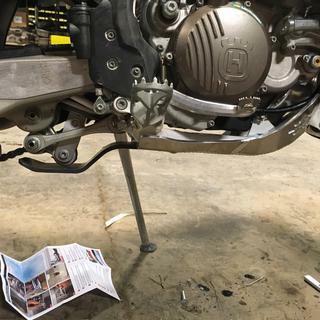 Installation to the enduro engineering skid plate was easy and simple and has proven durable. It didn’t work with my existing stock skid plate. Sent it back for a complete (one piece) skid plate that covers back to the linkage. Very good low cost alternative that protects a bikes linkage. 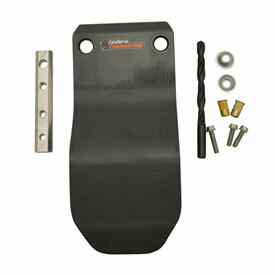 A good add on product that provide more protection to the undercarriage of your machine. Slides over rocks instead of hearing and feeling your linkage suffer from the elements. Worked great!! Was able to mount it to my 18 husky With the TM design skid plate just had to add on drill hole. take your time with the install, Read instructions. follow the instructions and youll be surprised. fit good on my EE skid plate. install 10mins for my self. Hardware is cheap and does not fasten down well. ended up taking this off and getting a different skid plate. Looks like it will work but the mounting hardware is cheap. Like another reviewer said, you can't tighten it down. You would think the EE linkage guard would bolt right up to an EE skid plate but that is not the case at all.i used my own hardware. I would have just returned it but I had already drilled holes in my new skid plate. It's been a headache to say the least. BEST ANSWER: The difficulty is low. There is a template and drill bit included in the kit. The threaded compression nuts serve a great purpose. Once the skidplate is mounted to the bike you would then bolt the link guard to the skidplate. A regular nut is difficult to hold while trying to mount the link guard, this is way we supply the compression nuts. Very low difficulty, comes with good directions and drill bit, it's just a matter of marking holes and drilling not rocket science. How many millimeters thick is the plastic?